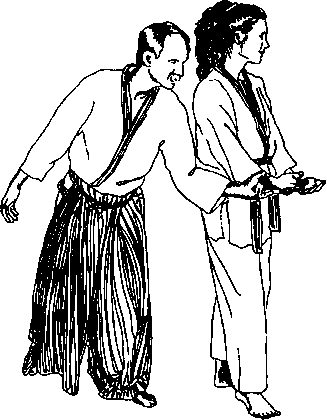 The following page shows the basic stretching routine we use at the dojo. The first thing to think about in doing these exercises is that they are not for stretching but for releasing and relaxing. 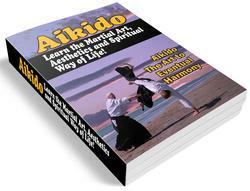 "Stretching" implies a forcing or tearing of the body, and the use of force against the body is a very un-Aikido idea. However, we will call these exercises "stretches" just because that is the common term. Each posture focuses on a specific part of the body. By paying attention to the sensations that are part of each posture, you will become more familiar with and able to control each part of your body. In each position, use a well-aligned posture, which will localize the sensations of stretch/release to a specific body part. The use of an open, lengthened body alignment will also make your breathing easier and more open. Your breathing should be full and easy. Your belly should expand gently as you inhale, along with your back and chest. Your breathing should not be forced. As you concentrate on experiencing each posture clearly, you will become able to utilize a direct releasing/relaxing of any tight spots. Focus your mind on the area where you feel the tightness. Breathe into and release the tightness. Flexibility is about learning to move with ease. You will be able to use each posture as a way of learning to take responsibility for your body. Do not strain or force yourself into anything. Every move should feel comfortable. Go only as far in any posture as feels good to you, and don't pay attention to how far you see other people in class go. Work with what you feel. Find out what images help you access your own body. Discover what each exercise has to teach you.